This is the COMPLETE Factory Package! The CB-4500 sews up to 7/8 inch, around 58 ounces of leather. The Cowboy CB4500 is our number one selling heavy duty harness stitcher. 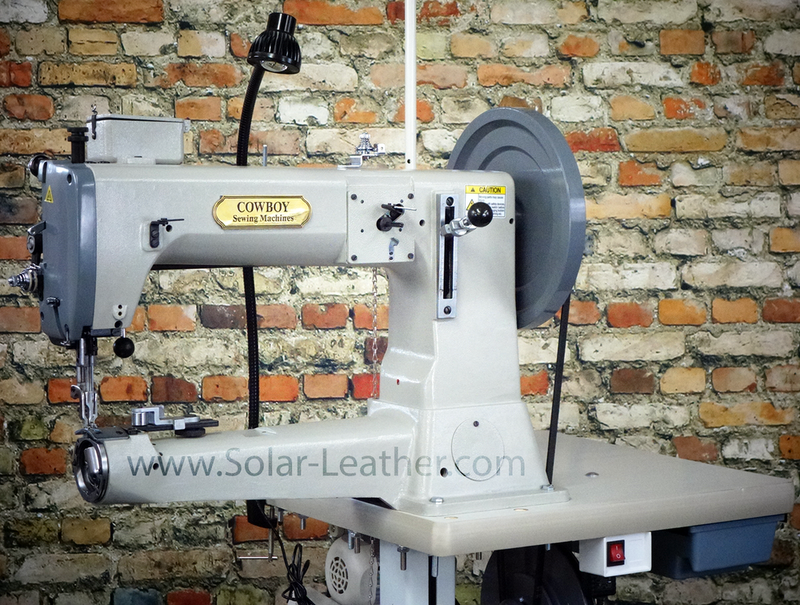 The leather sewing machine features an extra large barrel style shuttle hook which is the same hook used in the Durkopp Adler 205-370 and Juki TSC-441. This leather stitcher features a compound feed design with triple feed -- it has a needle feed, walking foot, and feed dog. This leather sewing machine has a full reverse mechanism that is capable of sewing the same length stitch in forward and reverse. The feeding action of this machine allows it to crawl over multiple layers of material with ease. This CowBoy leather sewing machine features a 16.5 inch long arm which allows ample room to sew large projects. The presser foot lift of the machine is about 1 inch and the machine is capable of sewing most materials up to a maximum sewable thickness of 3/4"-7/8". Cowboy is the only maker of machines that offers solid stainless steel presser feet and needle plates. The Flat Top Table Attachment supports wide projects. The CB4500 comes with a 3/4 hp, 110v Digital DC Servo Motor with speed setting and a 3:1 SR2 Speed Reducer that slows the machine down to a very controllable pace. saddles stitching, harness stitching, safety belts, shoes making, sheath, footwear, sofa, furniture upholstery, heavy and light tack, tire covers, footballs, punching bags, boxing bags, golf bags, baseball bags, softball bags, filter bags, handbag, fiber slings, lanyards, industrial safety products, military webbing, hoists.